Slewing units are used to rotate and position loads, such as containers, pallets, logs, packaged goods and, of course, grabs. 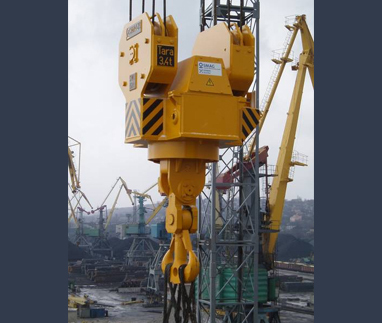 Nowadays, a PEINER slewing unit forms part of the basic equipment of almost every harbour mobile crane, but it is also used on stationary cargo cranes and deck cranes. The original electro-mechanical units with lifting capacities of 5-32 tons are now being supplemented by electro-hydraulic units. Today, they feature lifting capacities of 300 tons and more.